My twenty-seventh ground of 2018 was on Monday 1st October at Farum Park in Farum, Hovedstaden, Denmark. 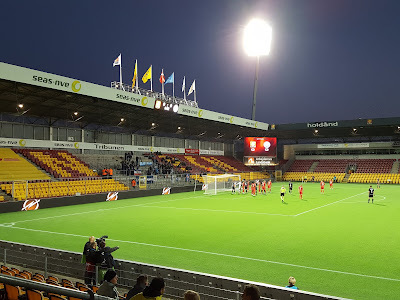 The match was Nordsjælland vs. SønderjyskE in the Danish Superliga. 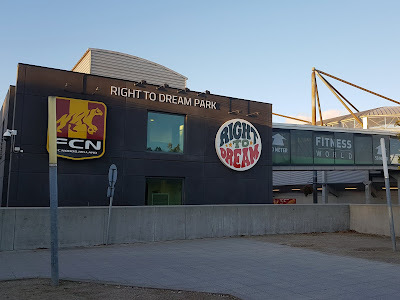 Farum Park is located in a sporting complex on the west side of the town. To the north of the football stadium are two full-size football pitches, two mini pitches and a swimming pool centre. To the east are a couple more mini pitches and an orienteering club while to the south there is a tennis club, a squash club and a karate school. The western side is the only side not bordered by activity centres with a housing estate beyond the access road and trees. The ground is one mile west of Farum railway station which is part of the A-Line and H-Line on the Copenhagen S-Train network. The venue has been home to Nordsjælland and their predecessors Farum BK since it opened in 1999. Farum Park is a compact bowl-shaped venue with uniform stand height the whole way round. The seating in each stand is split into two separate zones with the section of yellow plastic seats towards the front and the larger back section of maroon cushioned seats with the latter having the luxury of cup holders. The South Stand has corporate facilities all along the back of it as well as a media section to the right of the halfway line. There is a gap in seating in the middle of the stand and above this is the main TV gantry with room for commentators. There are a couple more smaller TV gantry spots towards either end which were also in use with this game having been selected for broadcast. The North Stand has a lounge hospitality area for most of the area behind the main seating while the two dugouts are located at pitch level in front of the seating along with the tunnel back to the player dressing rooms. The West Stand is mainly seating though directly behind the goal there is a terrace section for fans wishing to stand during the game. The western end has a lot of the stadium infrastructure in it namely a hotel, a gym, a restaurant and the club shop. It also has hospitality viewing areas for just under half the length of the stand at the back of the seating and there are gaps in the spectator areas to allow access to this. Next to this in the north-west corner is the Sky Bar which looks out over the pitch. There is a similar structure at south-west corner though it was not in use during my visit. At the opposite end of the pitch there is a comparable set-up with the seating split by a terraced standing section directly behind the goal. This end is given over to away fans. It is the only stand without corporate facilities at the back of it though there is a large screen in the south-east corner which replays the game. With this and the two Sky Bars encroaching on the seating areas the only quadrant with a full area of seating to the back of the stand is the north-east quadrant. The two standing areas provide space for 250 fans at each end with the overall stadium capacity of 10,300 (9,800 of which are seated). 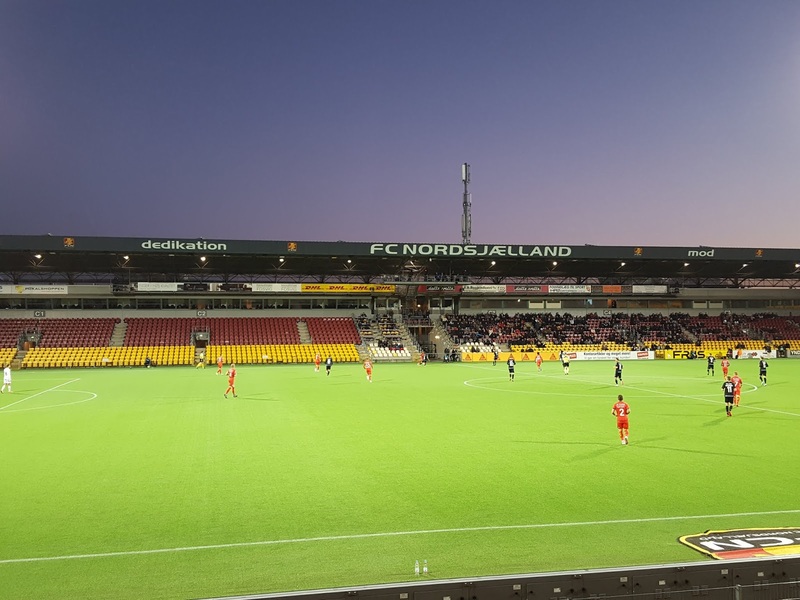 The teams went into the game with an identical win/draw/loss record with Nordsjælland having a pretty poor start to the season off the back of the previous season's top 3 finish in the Superliga. The hosts took the first step to putting that right when they took the lead in the 8th minute - a cross into the area was cleared as far as Karlo Bartolec who rode a challenge before curling a superb 20 yard effort into the top corner. The lead was doubled in the 17th minute when a swift counter attack saw Jonathan Amon play a great pass through to Andreas Skov Olsen in the area. Olsen rounded the keeper and though his effort hit the post it bounced straight back to the feet of Godsway Donyoh who tapped into an empty net from two yards out. 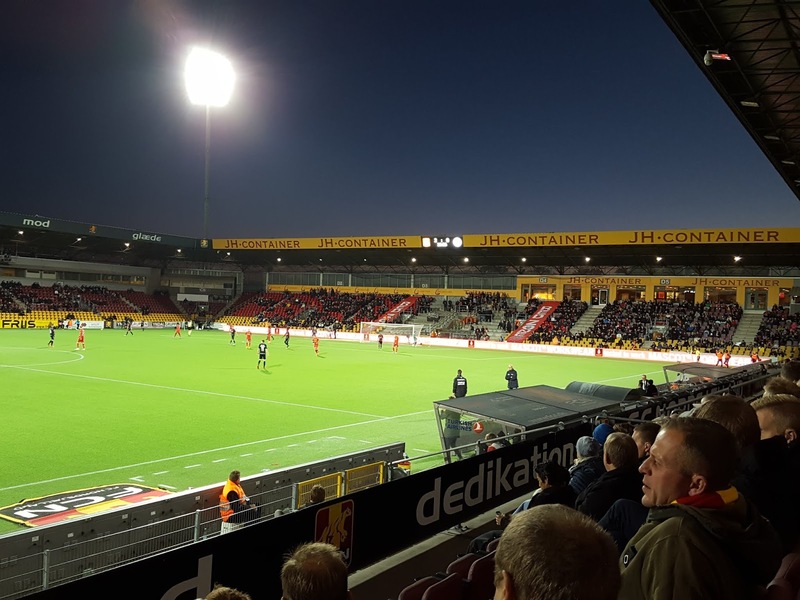 The home side continued to press and looked likely to get a third but in the 37th minute they gifted SønderjyskE a way back into the game. A hanging cross from Eggert Jónsson made its way into the area but despite the long time for the ball to come back down Nordsjælland keeper Nicolai Larsen completely missed it his punch resulting in the ball bouncing off the head of defender Victor Nelsson and trickling over the line for an own goal. 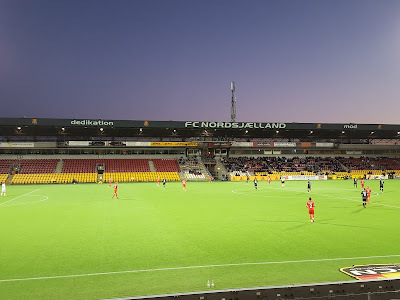 Nordsjælland reacted well and began to churn out more chances with a nice passing move in the 40th minute culminating in Jonathan Amon being slipped clean through. Amon shot straight at keeper Sebastian Mielitz from a few yards out though leaving the game at 2-1 at the break. Into the second half and in the 52nd minute a away corner was cleared as far cleared as Victor Ekani who chested the ball down before half volleying it from 25 yards. Nicolai Larsen did well to get down and palm the ball away to safety. This was Ekani's last meaningful contribution as four minutes later he received his marching orders for a second yellow. It came as he took two attempts to hack down Mohammed Kudus as Nordsjælland countered from a SønderjyskE free-kick. For some reason Ekani protested his innocence but replays showed he was nowhere near the ball and was rightfully dismissed. The man advantage was just what the hosts were looking for to get a grip back on the game and they re-established a two-goal lead in the 68th minute. Quick as a flash the ball was lofted over the right wing and a good first time cross into the six yard box from Andreas Skov Olsen was met by Godsway Donyoh who steered the ball in off the far post. In the 81st minute the home side rounded off the win with a near-identical goal to the last one. Again the ball was lofted to the right wing to Andreas Skov Olsen, again he squared into the six yard box and again Godsway Donyoh was on the end of it to stroke home. This was Donyoh's third of the evening securing him the match ball at the end of an impressive attacking display from Nordsjælland.